It’s as though the maker movement is a culture, where interaction occurs with people who work on traditional art forms and those who are technology driven. And as a culture, there is emphasis placed on creating and making as opposed to buying and consuming. Naturally, educators and industry have taken an interest in getting involved, in an effort to grow student engagement in STEM (science, technology, engineering and mathematics) activities and careers. The maker movement serves as an opportunity to create a “learning-through-doing” environment, where students can become exposed to different topics that will have more relevance to their lives and learning experiences. Are you ready to be part of the maker movement? Maybe you’re a maker, or perhaps you’re destined to be a rock star volunteer. These are just a few ways you can participate in the maker movement and the Greater Hartford Mini Maker Faire. Attending: Registration is free! Click here to sign up today. 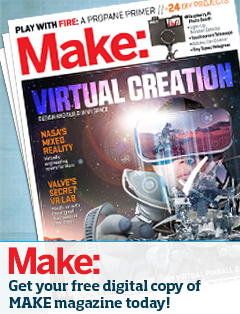 Exhibiting: Are you already a maker? Our call for makers is open and we’re looking for exhibitors! Apply here today! Sponsoring: Become a sponsor for the first ever Greater Hartford Mini Maker Faire! Click here for a downloadable flyer with more info. Volunteering: The Greater Hartford Mini Maker Faire wants you! Sign up for volunteer opportunities here. Are you involved in the maker movement? Share your story with us in the comments below! This entry was posted in Blog and tagged 3D printing, biotechnology, Connecticut, CT, design, DIY, educations, engineering, hacking, hands-on, maker faire, makerfaire, robotics, science, students. Bookmark the permalink.